The right lighting design makes a big difference in the feel and ambiance of your home. Any of our Hortons Home Lighting convenient Chicagoland locations will help you enjoy your home to its full potential by discussing lighting ideas with you for each room and developing the perfecting lighting plan for your home. The right lighting can add beauty and drama to a space; it can make a small room look big, and a large room look comfortable and inviting. The lighting sets the room’s atmosphere, and you can have a night of entertaining or a quiet night of relaxation, depending on the light effect you’re going for. Lighting can make a difference in so many ways, and it does so inexpensively compared to other home decorating and remodeling options. There are many types of lighting including accent, aesthetic, ambient, general, and task. A good lighting design concept combines multiple types of lighting in an area, according to the function and style of the space. << NEW! 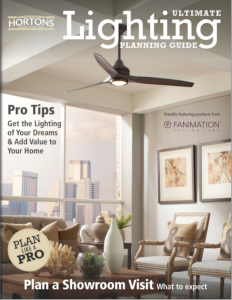 Check out our Ultimate Lighting Planning Guide.